On the eye, intense bright gold, reflection bronze. On the nose, yellow fruits and flowers, yellow peaches, melon and tobacco. On the palate, vegetable grape skin notes, clove, final on spices and a slight musky notes with a subtle exceptional soft vanilla. It's a girl! 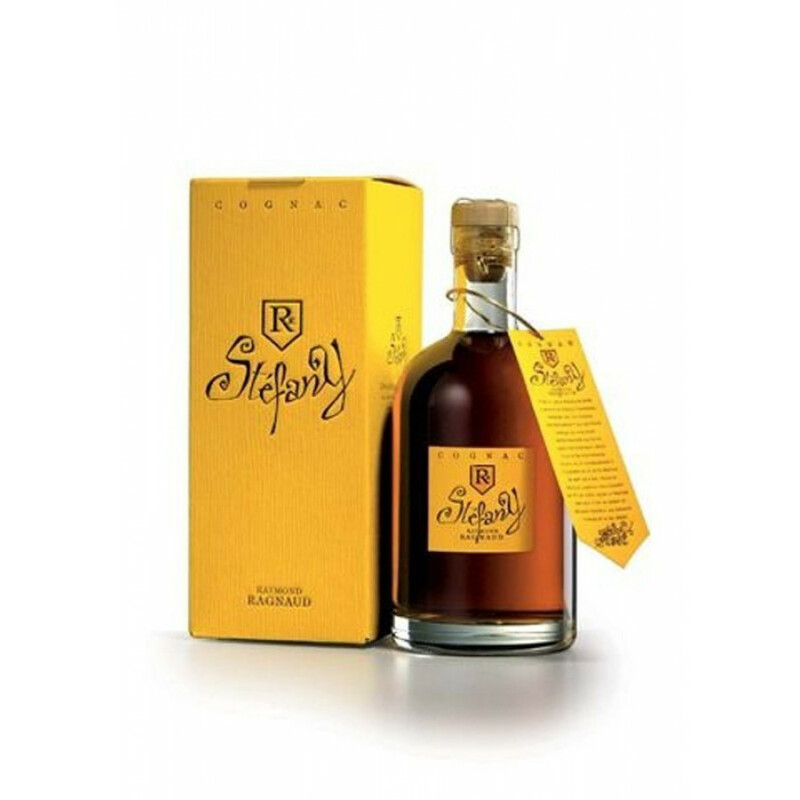 The Raymond Ragnaud VSOP Reserve Stefany Cognac was the first creation of the cognac house. A wonderful Grande Champagne offering, this VSOP quality cognac contains eaux-de-vie that have been aged for 7 years, and has been made in the traditional manner that the house continues to use to this day. As you'd expect by the name, this is a feminine tasting cognac - there's no agression here. Delicate and sublime. Beautifully presented in an almost decanter style bottle and presentation box - this would make a wonderful present for any lover of cognac (or a present to yourself...). Covering 47 hectares of Grande Champagne vineyards, Cognac Raymond Ragnaud is a family run house with a history that can be traced back to 1860. Producing ranges under the labels “Premier”, “Prestige” and “Carafe”, Raymond Ragnaud cognacs are created in the time old traditions that have been passed down through the centuries. Over the past few years the house has concentrated on increasing overseas sales, and now around 75 per cent of all Raymond Ragnaud Cognac are exported around the world. Tasting review by Raymond Ragnaud: Color: deep amber Nose: floral expressions with various plant aromas Palate: tender, almost 'fleshy', with strong tones of spicy grape, plum, and mirabelle plum. Finish: daffodil, cherries, and ginger. Tasting review by Raymond Ragnaud: On the eye: intense molten gold On the nose: peppery, rather musky, candied fruit. Background floral nose, with a lot of maturity and sweetness. On the palate: suave, white fruit compote, greengage, plum. Tasting review by producer: On the eye - a golden color. On the nose, a fine aroma with notes of grapes, vanilla, walnut, and chocolate. On the palate - the taste is smooth fruity, with light aftertaste of nuts. Otards VSOP combines a strong nose with floar notes, and green fruit with a rougher, earthy tobacco note in the mouth. Slight hint of spices and vanilla, a great product with a solid finish. Clearly some tobacco hints.